Is the most effective method to form complex shapes and offers unique thermal advantages. Forging is a cold process. The part is formed under high pressure which controls the grain structure and results in improved thermal performance. Forged fins can be made almost perfectly straight allowing for more fins per square inch. The fins can also be formed into an elliptical shape. The resulting increase in surface area can also be an important factor in improving thermal performance. The forging process has few limitations to forming shapes and complex fin designs. A forged part is performed in two dimensions within the tool to create complex shapes without the need for secondary operations. Hole, chamfers, pins, elliptical fins., steps, etc. are created in the tool in a single operation. 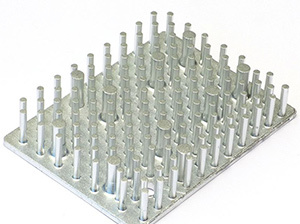 Precisions forded heatsinks offer several important advantages over their machined, die cast and extruded counterparts. The increased thermal performance coupled with the ability to expand to surface area without increasing the size of the heatsink are unique advantages. These factors are especially critical when space is limited and /or weight reduction is critical to the product. Precision forging can also produce complex shapes such as elliptical fins, staggered fins, round pin arrays, steps etc. within the tool. These features canned be achieved in an extruded or die cast part. Finally, precision forged heatsinks can offer be manufactured at a lower cost because most operations can be performed in the tool and secondary operations are reduced. Forging is also the most effective method for forming copper. Copper is difficult to extrude because it be heated to high temperatures to soften the metal. The can damage the extrusion tool. Secondary machining operations also result in expensive waste. Forging is a cold process, and copper heatsink can be formed with minimal waste.